[AUTO](VC):[Counter Blast (1)] When your G unit with “Saver” in its card name Stride during your turn, you may pay the cost. 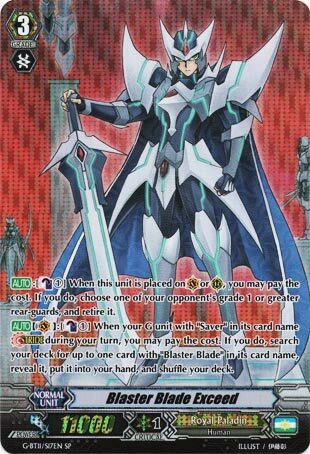 If you do, search your deck for up to one card with “Blaster Blade” in its card name, reveal it, put it into your hand, and shuffle your deck. [AUTO]:[Counter Blast (1)] When this unit is placed on (VC) or (RC), you may pay the cost. If you do, choose one of your opponent’s grade 1 or greater rear-guards, and retire it. I don’t think there is anything to say about Exceed currently that I didn’t cover last time I reviewed it. Oh, except that we have Gancelot Peace Saver revealed that solved this card’s immediate problem. Shame about the lack of real targets, but Gancelot and Alfred are solid enough. What’s up, Rogue Squad?! Instead of a Throwback for these next couple of weeks (especially seeing how most of this week is a throwback anyway), we’re looking at one of the most recent cards that came out this past year, Blaster Blade Exceed. Exceed is a great card to have as your main Vanguard and even as a rear-guard as it combines great with Alfred Holy Saver to make a potential 21k column with a Twin Drive. The only real drawback to Exceed is that his on-Stride skill is strictly for the aforementioned Alfred Holy Saver, Gancelot Holy Saver and Myriad Holy Saver (the latter not really used anymore), and the amount of targets to search for Blaster Blade named cards in the average Blaster deck, but it can set-up for either the potential 21k column mentioned earlier or to set up for Ultima. Exceed is still a solid card to this day and can potentially see some play in the up-and-coming premium format.